Lisa Davis (right), founder of the advocacy group Save Lake Texoma, near Rooster Creek Bridge at Lake Texoma State Park. 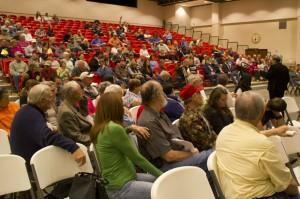 “The problem you’re facing is you’ve got some big elephants in your Lake Texoma. They’re big, wild ones,” Jackman says. Jackman is a Tulsa geologist and water consultant who spoke to area residents at a community meeting put on by the advocacy group Save Lake Texoma in Kingston last weekend. “One of them is the drought,” Jackman says. 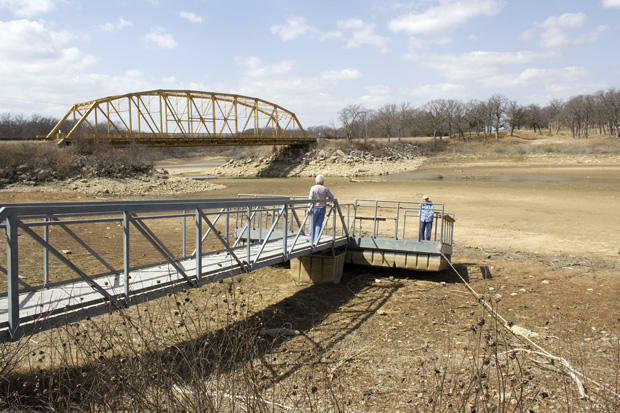 Texoma is experiencing a kind of trickle-down drought effect. The lake is fed by the Red River, which flows through areas of southwest Oklahoma and northwest Texas where the drought hasn’t stopped raging, so less water is making it to the reservoir before being soaked into the riverbed. That got the crowd riled up. But no one from the Corps or Southwestern Power Administration was at the meeting to defend the continued use of the lake for hydroelectric power generation — which can lower water levels by as much as three feet per month, according to the Lake Texoma Association, which is kind of like the lake’s chamber of commerce. In a January press release, Col. Richard Pratt, commander of the Corps’ Tulsa District, says in times of drought Texoma’s significant power and water supply storage is needed or the region wouldn’t have consistent water and electricity. He says there are already power production limits in place, and if the drought gets worse, more will come. Another issue is the promised construction of a new resort to take the place of Lake Texoma State Park, something residents are still waiting on from the private developer, Pointe Vista. There’s talk of lawsuits, and bills to address all these issues. None of it is certain. For residents, joining in the county’s cleanup of the lakebed while the water is low is something they can do now, in this front line of a battle over a dwindling resource.